A quarter mile away from the main island of Singapore. 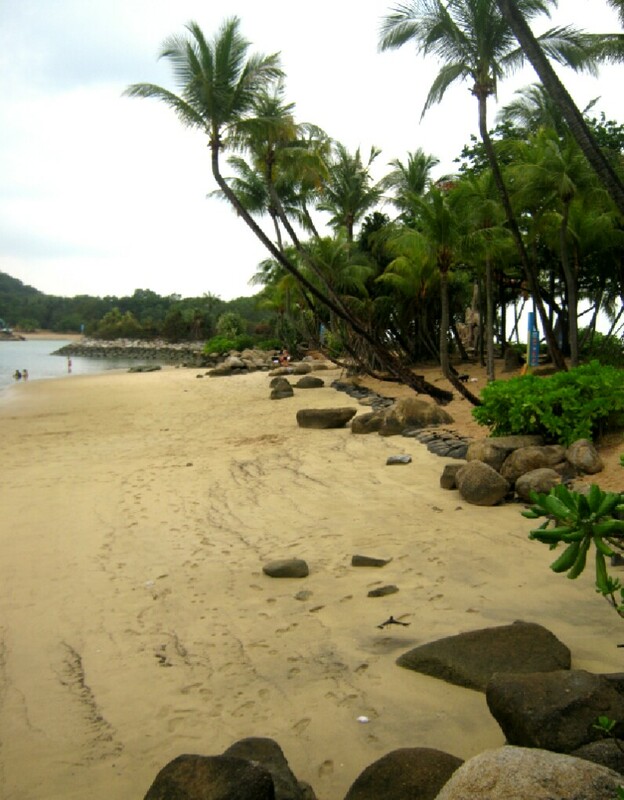 Sentosa is basically an island full of man-made beaches for tourist attraction as well as for locals who would love to spend their weekend away from home, an escape from the city. Long ago, this island was called “Dead Black Island”, due to lack of fertile soil, and seen as too unhealthy for habitation. The development of the island began in 1972, this was converted into man-made beaches. The sands where imported from neighboring Asian countries. On the same year, the island was renamed to Sentosa. From Sanskrit “Santosha”, a Malay word meaning “peaceful and tranquility”. Sentosa can be reach via cable car, sky train, by car, or even on foot. 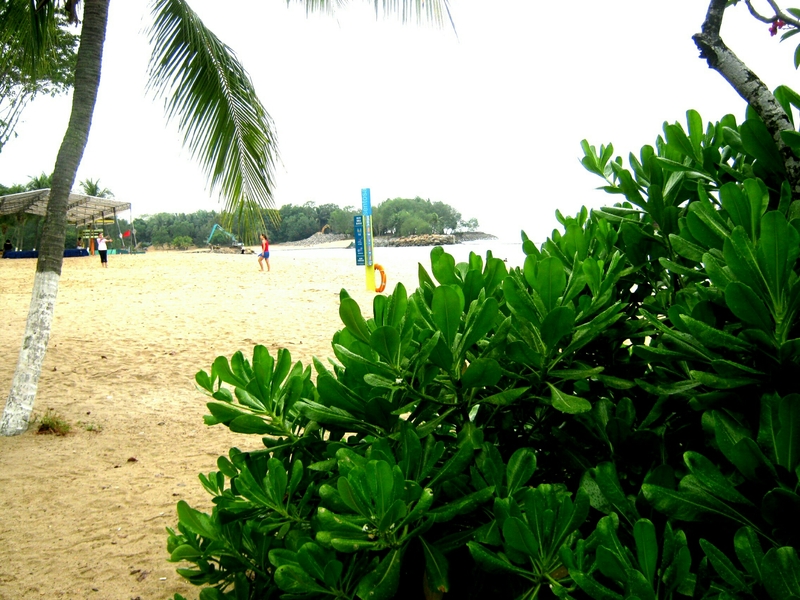 For several times, I go back to this serene, scenically relaxing beaches (Palawan, Siloso, and Tanjong) of Sentosa. Just Be Patient, Good Things Take Time. One fine afternoon, when everyone else were scurrying back to go home. We stayed and waited. We were strangers to this country and we travelled far. All we wanted was to experience sunset in a foreign country and take some photos of it. We waited patiently. But the heavy thick clouds doesn’t seems to cooperate with us. Undecided whether to stay or leave, uncertain, and doubtful. Still hoping to see the glimpse of the sun before it totally goes down over the horizon. Alas, peeking through a tiny clearance, the sun rays pushes its way through the thick clouds. Gave us a glimpse of hope. Then there it was, just for a few minutes, then it’s gone. Our life just like the sun, we tend to forget its importance. Precious moments passed by unnoticed as we focus on our day to day activities. The routinary life. We struggled to make ends meet, hurrying everything up to accomplish our work so we can go home. Next morning, hurrying to go to work, and then hoping the day would end sooner. You’ve been repeating this cycle for several years now. Five years have passed by, then ten years, then fifteen years, then realizing life is passing you by. Nothing much happened nor good memories to recall. You were busy. Of what? Just busy. You don’t seems to recall why you were so busy all this time. This was the life you chose to live with. But not for me. Grabbing opportunities as it present itself. Travel far enough, and enjoying every moment while it last. Life itself has its ups and downs. Deal with it, and then move on. Learn to accept and see things for what they really are. Don’t complicate your life, and take things less personally. See challenges in life as a new learning experiences. Accept bad experiences as a price you pay in order to enjoy good experiences and opportunities as well. Try to be a better person than you were yesterday. Create your own path, it’s your own road and yours alone. It may be bumpy and rough. Others may want to walk it with you, but no one can walk that path for you. Focus on what you want, and what makes you happy. Choose to be happy. Laugh and smile as much as you can. Love as if it is your first time. Appreciate friends who stick with you like a gum, even in the worst period of your life. Surround yourself with people who know your worth, lift you up and encourages you. Be patient, and understand that everything happens for a reason. Just like the sun, with out sunset there is no sunrise. Do not focus on the clouds, focus on the opportunity to see the sun. The feeling of contentment, pleasure, and triumph of seeing it after the long wait. This photo was created via PowerPoint then coverted to jpg.